Home>Programs>Olympic Development Program>What is ODP? Kansas ODP is an enrichment opportunity for a player in addition to his/her club team. ODP targets elite players born in various eligible birth years. Elite players must possess a high degree of technical proficiency and comfort/mastery of the ball; tactical awareness and understanding of how to play the game with and without the ball; physical athleticism to compete and have success versus their peers; and psychological mindset to work harder than most, can overcome adversity and mistakes, can follow instructions and be open to new ideas and ways to play the game, and to push themselves to reach outside their comfort zone. Kansas ODP has produced players who have gone on to do some fantastic things in the sport of soccer. Some past ODP alums to name a few – Matt Besler (US MNT, MLS-SKC); Scott Vermillion (NCAA Champion-Virginia; MLS-KC Wizards, Colorado Rapids); Frances Silva (West Virginia, FCKC); Dorian Bailey (U15-18 US WNT, St. Theresa’s HS); Adrianna "AD" Franch (U23 WNT, OSU, Portland Thorns); Parker Roberts (U15-U20 WNT, Blue Valley North); Maycee Bell (U16 WNT, Trinity Academy HS). ODP is a nationwide process dedicated to the identification and training of players for State, Regional, and National Teams. US Youth Soccer ODP has programs in all 55 State Associations and the United States is divided into four (4) ODP Regions - Kansas is a part of Midwest Region. Regional teams are selected for both boys and girls. Regional players are eligible to participate in future Midwest Region ODP events along with National Training Events - getting exposure to Youth National Team Staff. ODP age groups are based on the year of birth and have a January 1-December 31 cutoff date. Example; 2001,2002, etc. ODP starts at the state level. 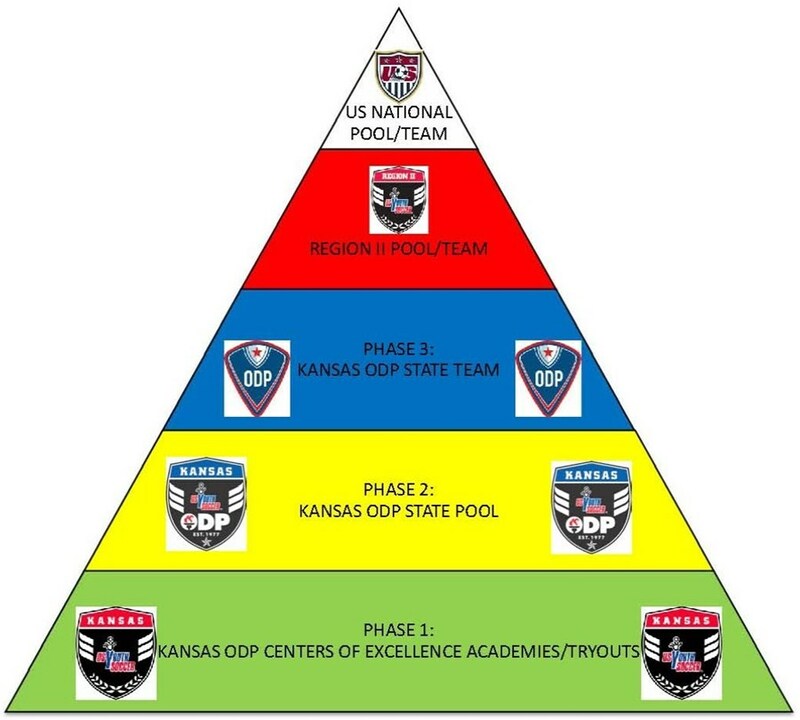 Kansas ODP follows three simple Phases. At the conclusion of each Phase, players will be selected and “INVITED” to continue to the next Phase. As you participate in each Phase, there will be a fee associated to cover basic expenses to operate and provide the necessary staffing. If you (or your child) possess these attributes and qualities, we encourage you to attend an ODP evaluation. To learn more about ODP visit our FAQ's page or contact the Nathan Hunt.